Home global Who is Akshay Venkatesh? Indian – Australian Akshay Venkatesh Wins the “Noble of Maths” ! 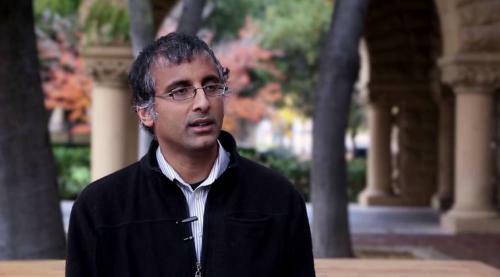 Akshay Venkatesh, a 36-year-old renowned Indian-Australian mathematician teaching at Stanford University, is one among the four winners of mathematics prestigious Fields Medal. This award which is given every four years to the most renowned researchers in the field of mathematics under the age of 40 is considered to be equivalent as the Nobel Prize for Math. Besides Venkatesh, the other three winners of the Field Medal are: Caucher Birkar, a Cambridge University professor; German Peter Scholze, a professor at the University of Bonn and Italian Alessio Figalli, an mathematician who teaches at ETH Zurich. Peter Scholze, 30 year old was the youngest winner. Venkatesh was honoured for his use of dynamics theory, his work in analytic theory, whole numbers and prime numbers. The prize includes a gold medal and cash award of Canadian $15,000. After Manjul Bhargava, Venkatesh is the second Indian-origin mathematician to win the prize. Manjul Bhargava, a Princeton University professor, received this award in the year 2014. Venkatesh was 2 years old when he moved to Australia with his parents. He finished his high school when he was 13 and graduated at the age of 16 from the University of Western Australia with first class honours in mathematics in 1997. He earned his PhD at the age of 20 in the year 2002 and since then he has held high academic positions. He held a post-doctoral position at Massachusetts Institute of Technology, after that a Clay Research Fellow and now a professor at Stanford University. He has been recognized with many other prestigious awards like the Infosys Prize, the Salem Prize, the Ostrowski Prize and the Sastra Ramanujan Prize.